The Rural House "El Postigo" is located in the municipality of Pedroso de Acím in Caceres, 6 km away. of the A-66 (Autovia Ruta de la Plata) between Plasencia and Cáceres. Comfortable and cozy, it has managed to respect the charm of the traditional, endowing it with the comforts of our time, essential for a comfortable stay. Decorated and decorated with typical furniture of the area and restored by hand. Its wood paneled throughout the house, including the bathrooms, its stone walls and a very careful decoration, give a cozy rural atmosphere. The Rural House "El Postigo" is located in the municipality of Pedroso de Acím in Caceres, 6 km away. of the A-66 (Autovia Ruta de la Plata) between Plasencia and Cáceres. Comfortable and cozy, it has managed to respect the charm of the traditional, endowing it with the comforts of our time, essential for a comfortable stay. Decorated and decorated with typical furniture of the area and restored by hand. Its wood paneled throughout the house, including the bathrooms, its stone walls and a very careful decoration, give a cozy rural atmosphere. It is a fully equipped house with capacity for 8 people and 2 additional children, which has: 4 double bedrooms and 4 full bathrooms distributed as follows: - Two double bedrooms with double bed and individual bathroom. - Two double bedrooms with single beds and individual bathroom. - Two extra beds for children. - There is a playground available. - Bedding in their rooms. - Towels, dryer, gel and shampoo in each bathroom. - Large living / dining room with fireplace. - Fully equipped kitchen / dining room (oven, hob, washing machine, dishwasher, microwave, coffee maker, toaster, blender ... ..) - Heating and air conditioning throughout the house. - Large terrace of 40 m with barbecue, gazebo with garden furniture and solarium area with fine rain where you can sunbathe for the day and enjoy a pleasant summer evening having a drink with friends and watching the stars. There is a lovely pool 5 minutes walk from the Casa Rural. A little wood for the fireplace (season from November to March) and coal for the barbecue: gift of the house. And our welcome gift, a frasquita of our Organic Olive Oil of Organic Farming with a rich cheese from the area. Ojalá que todo el mundo que venga a esta casa corresponda cuidándola como merece. Por nuestra parte creo que así lo hemos hecho. Hemos pasado una semana de vacaciones del 1 al 8 de agosto en una casa espectacular, no ha faltado ningún detalle ni en la decoración, ni en el equipamiento de la casa, muy bonita y acogedora. 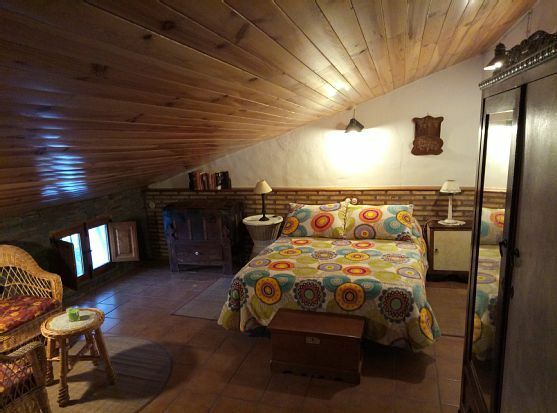 Somos un grupo que utilizamos siempre casas rurales y puedo asegurar que no hemos encontrado hasta ahora una casa tan completa, no nos ha faltado de nada. Aunque ha hecho mucha calor la casa estaba acondicionada con aire acondicionado y se estaba muy bien. Mari Luz, la dueña una persona encantadora, y que decir de su madre Carmen, súper atenta, amable y servicial. La casa está en un Pueblo pequeñito y muy bonito, tranquilo y acogedor. Muchas gracias a Mari Luz y Carmen por qué nos hemos sentido como en nuestra casa. Hemos estado un fin de semana tres familias con niños pequeños y nos ha gustado mucho la casa. Esta muy cuidada y limpia, la recomendamos totalmente. El pueblo es muy tranquilo y la casa es muy fácil de encontrar.